Sign up for Broadjam today to follow Ellen Bukstel, and be notified when they upload new stuff or update their news! FLORIDA BASED FOLK-POP SINGER-SONGWRITER DRAWS FROM HER LIFE TO BRING HOPE, LAUGHTER, TEARS,BITING WIT AND INSPIRATION TO HER ECLECTIC DEBUT 'DADDY'S LITTLE GIRL' Those who dive into the full sweep of the 15 tracks on the South Florida based artist's lifetime in the making indie solo debut Daddy's Little Girl quickly agree with pop superstar Michael Bolton, who calls Bukstel "an amazing artist and spirit." But they seriously have no idea whether to laugh or cry. 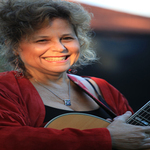 A Renowned Community Activist In South Florida, Bukstel's Songs Have Been Acclaimed by Folk Legends (Peter Paul & Mary, Janis Ian), And Pop Stars (Michael Bolton)--And She Even Opened For Barack Obama!